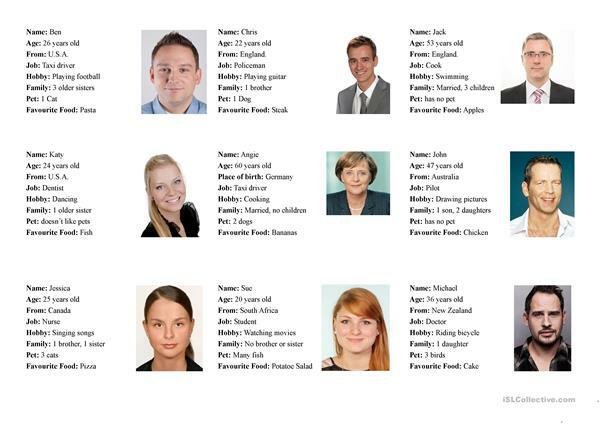 Print and cut out the IDs. Give one to each student. They are on a party and have to ask each other and write down the answers. "What is your name?" - "My name is Benjamin." Later they ask their neighbour "Who did you meet on the party?" -> "I met Benjamin." "How old is he?" "He is 26 years old." "What is his hobby?" "His hobby is kite flying." Students practice to introduce themselves and use he, she, my, his, her. Edit the IDs to match your students' skill. The present downloadable teaching material is a great resource for business/professional students, high school students, elementary school students and adults at Elementary (A1) and Pre-intermediate (A2) level. It is a valuable material for strengthening your class' Listening and Speaking skills. It focuses on the topic and words of Greetings. My worksheets have little to no special layout. Mostly they are as simple as possible.